Hey everyone check out the Greater Dandenong Sing for Good entry. We are a group – no – a family of people from diverse backgrounds who get together to celebrate the healing and unifying power of song. We like to share a song, a story and a laugh each week and we know how important these connections are to each one of us and we want the same opportunities to be available for everyone. Hey everyone check out the St Kilda Sing for Good entry. With One Voice St Kilda is one of Creativity Australia’s social wellbeing and inclusion choirs. We may all come from different walks of life, but singing and a love of music brings us together every Monday evening. We enjoy singing a range of songs, and the welcoming community of our special choir. This particular song was a crowd favourite in our recent Acland Street performances! Hey everyone check out the Ashburton Sing for Good entry! Creativity Australia Choir Ashburton Sings meet every Wednesday night at 6.15pm-7.30pm at Ashburton Baptist Church, Marquis Street, ASHBURTON. We are a relaxed, happy and supportive group. There is a vibrancy about Creativity Australia choirs that’s hard to explain – you just feel it. We have a spirit that is contagious and fills us with joy that lasts till the next time we meet. Our conductor, Kym Dillon nurtures us to sing with confidence and a joy to uplift us from mere mortals to ‘singers’. Real singers! Our video was filmed over two weeks at Wednesday night choir and we hope you can feel our spirit. Not only are we talented choristers, we are also video stars thanks to Kym and his talent in putting together our video. Please show us you like our efforts with lots of ‘heart likes’ and shares. Oh and please donate to our Ashburton choir with your hard earned money, it is used to keep us singing!!! Join With One Voice Footscray for a celebration of six years of song. 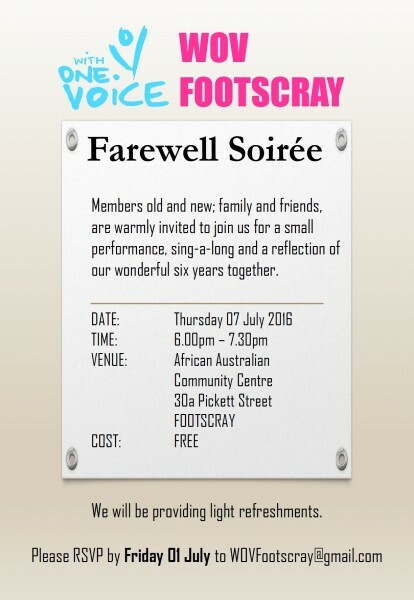 In July we bid a fond farewell to the wonderful With One Voice Footscray, with an evening of celebratory songs and supper conducted by Jane York. Please RSVP to WOVFootscray@gmail.com.